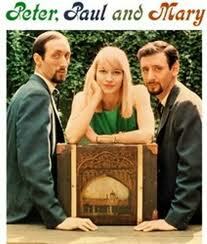 Peter, Paul and Mary became one of the most successful folk groups of the 1960s. Today, Peter Yarrow and Noel Paul Stookey continue to perform in tribute to their 50-year collaboration and friendship with Mary Travers, who passed away in September, 2009. The following are excerpts from a heart-warming interview with Peter Yarrow, published in an article written by Tom Keogh as a Special to The Seattle Times on August 25, 2011. Peter Yarrow recalls looking out from a stage at the Lincoln Memorial, guitar in hand, at a quarter-million people gathered for the March on Washington. The crowd, soon to hear Martin Luther King, Jr. deliver his immortal “I Have a Dream” speech at the August 28, 1963, National Mall rally for civil and economic rights, was also stirred by what Yarrow calls “music of conscience” performed by Bob Dylan, Joan Baez, Mahalia Jackson, and his own hugely popular folk trio Peter, Paul and Mary. The two singers and hit songwriters – Yarrow wrote “Puff, the Magic Dragon,” Stookey, “The Wedding Song (There Is Love)” – have continued as a duo since the 2009 death of Travers.